Using a fork, poke each potato about 6 times. 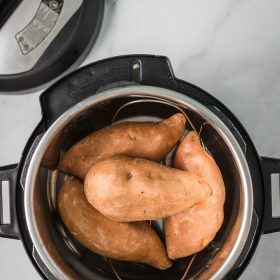 Place the trivet into your instant pot (the one that came with it) and pour in the 1 cup of water. Place the potatoes on top of the trivet. It’s okay to stack them if needed. Put the top on and seal the instant pot. Cook on manual HIGH pressure for 16 minutes (if your potatoes are sightly smaller, go for 14 minutes and if your potatoes are extra large, go for 18 minutes). ** When the instant pot is done cooking, let the pressure naturally release which will take about 8-10 minutes. You’ll know it’s done when the metal pin has dropped. Optional step: put the cooked potatoes on a baking sheet, spray with cooking spray. Broil the potatoes for about 3-4 minutes (make sure to watch carefully!) to lightly crispy up the skins. I only do this if I’m eating a simple sweet potato with brown sugar etc. Totally not a necessary step! **Cook time can vary depending on the size of your potatoes. If they end up underdone, you can cook the potatoes for an additional few minutes.